Although stereo is still the most common format for basic music listening, 5.1 surround has become the audio format of choice for today’s advanced visual media, and is beginning to be recognized as a superior vehicle for pure musical enjoyment as well. 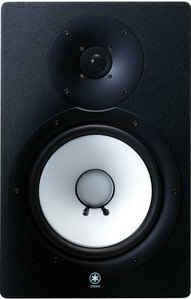 But to properly mix and produce surround sound you need a good 5.1 monitoring system. The HS-series speakers and subwoofer are the perfect choice if you want competitive surround-monitoring performance without having to spend big-studio megabucks to get it. Combine five HS50M or HS80M powered near-field reference monitors with one or more HS10W subwoofers, and you’re ready to produce and deliver state-of-the-art surround sound. Speaker response can vary greatly depending on the size, shape, and surface acoustics of the room in which they’re used, as well as how they’re placed within that environment. The HS50M and HS80M give you extra room-matching and speaker placement versatility with ROOM CONTROL, MID EQ, and HIGH TRIM response control switches that are specifically designed to compensate for common acoustic deficiencies and monitoring needs. The ROOM CONTROL switch, for example, can be used to compensate for the unnatural low-end exaggeration that usually occurs when speakers are placed close to walls or in corners. The MID EQ switch gives you subtle midrange boost and cut options in addition to flat response, while the HIGH TRIM switch offer the same type of response-tailoring capability for the high frequencies. 42Hz - 20kHz frequency response.